Arrow is a Crown Commercial Service Supplier making it simple for public sector and healthcare organisations to use ClineCall. Our ClineCall Video Platform offers a range of cloud based video conferencing and consultation solutions to the healthcare professional. Whether you are looking for a simple and cost effective way to hold a video consultation with a patient, consult with another clinician via a video link or manage unscheduled emergency video enquiries, the ClineCall Service can help. ClineCall is simple to use, works on any video device and overcomes the challenges associated with using public services such as Skype. Already used by a number of NHS organisations across the UK and in a number of countries worldwide, our service provides efficiencies for clinicians and most importantly better access for their patients. Our cloud-based video consultation service allows a patient to talk to a doctor or clinician using a computer, tablet or iPhone. The consultation takes place at a prearranged time and for a specified period, encouraging timely attendance. The technology is intuitive, secure and IG compliant. Our cloud-based video consultation service allows a patient to talk to a doctor or clinician using a computer, tablet or iPhone. The consultation takes place at a prearranged time and for a specified period, encouraging timely attendance. The technology is intuitive, secure and IG compliant. Our clinician to clinician video conferencing service allows healthcare professionals to quickly and easily collaborate face-to-face from any location using existing smartphones, tablets, PC’s or dedicated conferencing equipment. As with our patient video service, the technology is intuitive and video calls are secure and can be scheduled or ad-hoc. Our ClineCall Unscheduled Emergency Care (UEC) service enables healthcare providers to manage multiple video calls in a contact centre or triage environment. They can be used for out-of-hours services such as the 111 non-emergency care service or as an A&E video triage service. Patient video calls can be queued and distributed in the same way that telephone calls are. Arrow is a Crown Commercial Service Supplier making it simple for public sector and healthcare organisations to purchase our Secure Cloud Video Conferencing and Consultation Service and our Cloud Telephony Service. Our ClineCall Platform offers a range of cloud based video conferencing and consultation solutions to the healthcare professional. 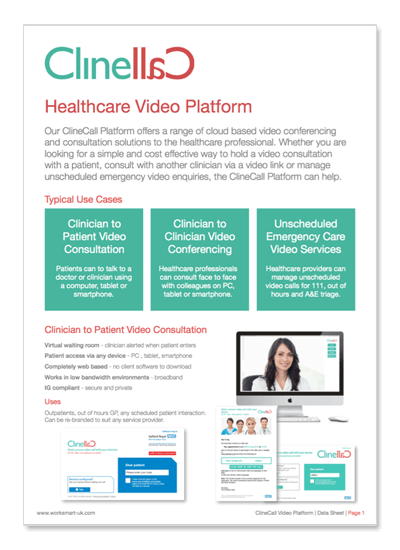 Whether you are looking for a simple and cost effective way to hold a video consultation with a patient, consult with another clinician via a video link or manage unscheduled emergency video enquiries, the ClineCall Platform can help.